The findings are the subject of a July 24 article in the journal Small (Wiley-VCH, 2013), co-authored by associate professor Mathew M. Maye and research assistant Wenjie Wu G'11, G'13. "At SU, we have developed a new synthetic pathway to tailor the internal microstructure of nanomaterials," says Maye, whose research spans inorganic chemistry, catalysis, materials science, self-assembly and biotechnology. Maye's approach begins with a pre-synthesized iron nanoparticle core. After synthesizing the core in its crystalline metallic form, he and Wu chemically deposit thin shells of chromium onto the iron. When the "core/shell" nanoparticles are exposed to high temperatures, they anneal. Moreover, the iron and chromium diffuse into one another, forming an iron-chromium alloy shell. Thus, the "core/alloy" product has an interface similar to some forms of stainless steel. Since stainless steel is known for its resistance to oxidation, the big challenge for Maye and Wu has been finding out how nanoparticles cope during this process. "We've discovered that nanoparticles exhibit a unique behavior when oxidized," he says. "A thin, iron-chromium oxide shell forms, leaving behind an unoxidized iron core. Even more interesting is the fact that a void forms, separating the core from the shell. This phenomenon is known in materials science as Kirkendall Diffusion, or Vacancy Coalescence." This kind of work, he adds, wouldn't be possible without high-resolution electron microscopy, X-ray diffraction and magnetic measurements. Although "core/alloy" fabrication is a new approach, it may allow for more diverse forms of alloy nanomaterials. "Most alloys we take for granted at the macroscale, such as steel, are hard to fabricate at the nanoscale, because of ease of oxidation and other specific conditions that are required," says Maye. "Our approach may open new doors." A recipient of many honors and awards, including the Presidential Early Career Award for Scientists and Engineers, Maye joined SU's faculty in 2008. 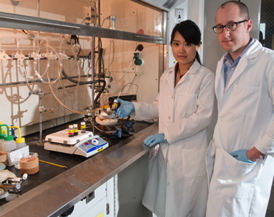 Wu, whose expertise encompasses nanomaterials synthesis, was the lead graduate student on the project. In August, she earns a Ph.D. in inorganic chemistry from SU. Maye's work is supported by the American Chemical Society Petroleum Research Fund. It has made use of the Cornell Center for Materials Research, which is part of the National Science Foundation's Materials Research Science and Engineering Centers, as well as the Binghamton University Analytical and Diagnostics Laboratory and the SUNY College of Environmental Science and Forestry Microscopy Facility.